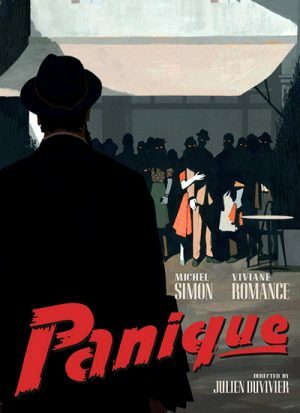 There's precious little "panique" in Julien Duvivier's 1947 masterpiece Panique. Rather, it's more of a gleeful hysteria, as the film traces the cloud of suspicion that gathers around a lonely, eccentric man until it explodes in a frenzy of surreal mob violence. Based on Georges Simenon’s 1933 novel Les Fiancailles de M. Hire, Duvivier’s film kicks off in a realist register, then gradually transforms into a noirish romance of deception until finally settling into a tragic allegory of wartime collaborationism and the cruel madness of rumor, fear and and spite. -- The Art of Subtitling - in this new program, Bruce Goldstein, director of repertory programming at New York's Film Forum and founder of Rialto Pictures, discusses some of the challenges that translators are presented with when translating big literary works and creating subtitles for films. Some specific examples are provided from Panique. Also, the work of translator Julien Duvivier expert Lenny Borger is highlighted. The program was created exclusively for Criterion in 2018. In English, not subtitled. (21 min, 1080p). -- Pierre Simenon - in this new video interview, Pierre Simenon, author and son of novelist Georges Simenon, discusses the enormous literary legacy of his father, the atmosphere of his writings and the difficulty of recreating it in a film, and some of the key similarities and differences between the original novel and the film that Julien Duvivier directed. The interview was conducted exclusively for Criterion in New York in August 2018. In English, not subtitled. (16 min, 1080p). -- Guillemette Odicino and Eric Libiot - presented here is a filmed conversation in which critics Guillemette Odicino and Eric Libiot discuss the production history of Panique and the socio-cultural environment in which it emerged, the film's visual appearance and tone, and Julien Duvivier's style and legacy. The program was created for the first high-definition release of Panique that TF1 produced in France in 2015. In French, with optional English subtitles. (21 min, 1080p). -- Trailer - presented here is a new trailer for Panique that was used by Rialto Pictures for the recent re-release of the film in the United States. In French, with imposed English subtitles. (3 min, 1080p).